Below we have an interactive guide and map of La Nucia for visitors and tourists visiting the small town of La Nucia situated in the center of the region of Marine Baixa on the northern Costa Blanca area of Spain. La Nucia is located in a fruit valley eight kilometres north of Benidorm and fifty kilometres away from Alicante on the Northern Costa Blanca. 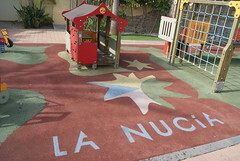 La Nucia is an inland town located to the north west of Benidorm and south of Altea in the comarca of Marina Baixa in the provice of Alicante and the communidad de Valencia. Nearby towns include Polop, LÁlfas del Pi, Finestrat, Callosa d’En Sarria, Calpe, Orxeta and Villajoyosa. La Nucia has slightly over 14,000 permanent residents. Places of interest in La Nucia include the Ermita de San Vicente which dates back to the 19th century, the public gardens which have a waterfall and several fountains. La Nucia also has its own football team. The nearest beach to La Nucia can be found in the sea side resort of Albir. Expats flock to La Nucia to go shopping at Labels and Tables where one can purchase clothing from the main chain stores in the United Kingdom at vastly discounted prices. Where is La Nucia located in Spain? What is the nearest airport to La Nucia? How do I get to La Nucia? Where can I find driving directions to La Nucia? Where can I find a free streetmap of La Nucia? Where can I get a hotel map of La Nucia? What is the latest La Nucia weather? This free Google map of La Nucia can be used in many ways: as a streetmap of La Nucia, as a map of La Nucia hotels, as an La Nucia apartment map, as a way of getting driving directions to La Nucia or as a map showing the main tourist attractions and sights in La Nucia. La Nucia is a pretty inland town surrounded by mountains. Towns close to La Nucia include the inland towns of Polop and Callosa d’en Sarria. The coast is only 20 minutes drive away with the nearest towns being Altea, Alfaz del Pi and Benidorm. Using the buttons on the top left you can ‘zoom’ and ‘pan’ and take an interactive virtual tour of La Nucia watching the panoramic images and pictures of the sights and attractions of La Nucia. You can also choose the point you want to have in the centre of the map by double clicking. This interactive Google La Nucia map and guide is best used as a tourist information guide as it shows some of the best sights, attractions, tourist spots, famous landmarks and places of interest in La Nucia. Alternatively you can use the La Nucia map as a street map to help you with driving directions and travel information, to and from La Nucia. You can use it from your place of origin such as Alicante airport or Valencia airport. It will help you get to La Nucia and also help you get around La Nucia when you are here on your trip or holiday. Try take an excusion to the popular tourist sight of Guadalest, a famous landmark of the Costa Blanca. On the map of La Nucia we have placed markers showing the locations of La Nucia’s best-known tourist attractions and sights. These markers and pins show the locations of the famous buildings, museums, galleries, parks, beaches, golf courses, major sights of interest, tourist offices, markets, hotels, apartments and restaurants within La Nucia. Use the interactive map to show you where your accommodation is situated for your stay in La Nucia. You can find all the La Nucia hotels, apartments, villas, guesthouses, hostels, pensions and camping sites that are in the La Nucia area. You can change the street and road map view to a view of the terrain of La Nucia or you can choose a Google Earth satellite view of La Nucia which shows you actual images of La Nucia from the sky above. Map Page Summary – Visitors to La Nucia can use the map above in conjunction with our tourist information pages to learn and find out what to do, where to go, how to travel and get around, what to see and do in La Nucia. Explore La Nucia and discover many of the hidden places within the town or use the map for planning trips and excursions outside of La Nucia.